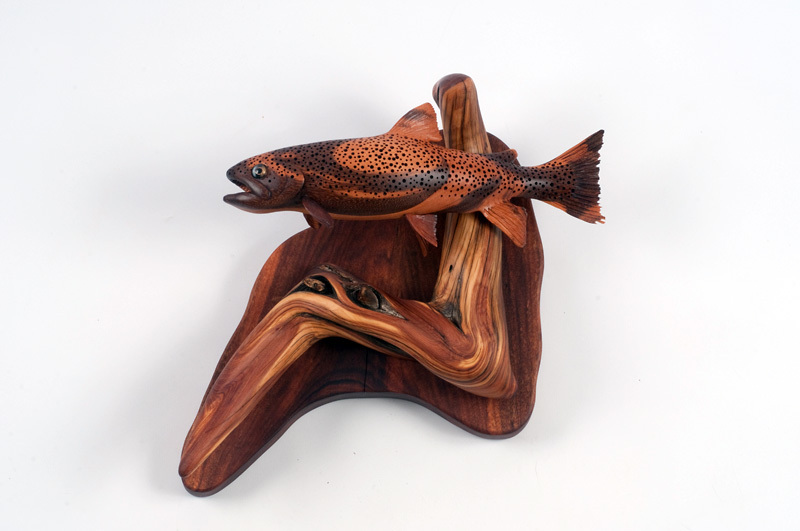 Tom Dean: “After graduating from the University of Montana in Marketing and Business Management in 1986, I jumped into the workforce, focusing on my newly acquired sales and marketing skills. Never in a million years did I think that I would be calling myself an artist. 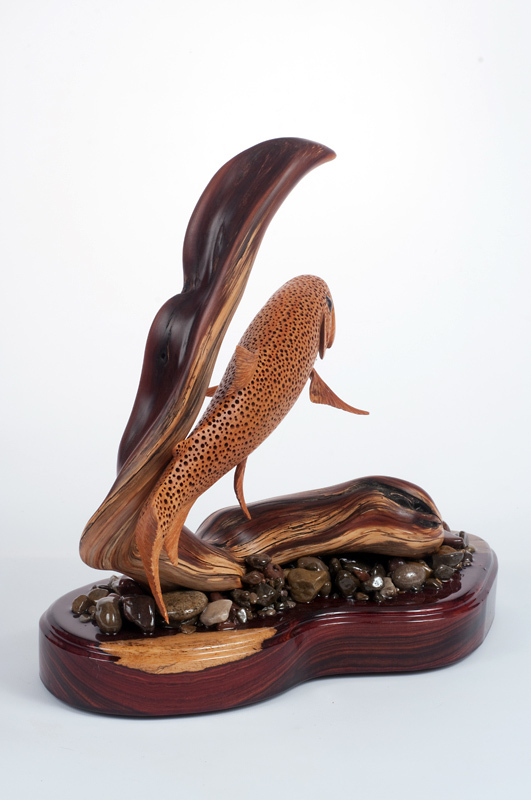 It is truly an amazing story of how one Dremel tool led me to find a hidden talent for carving. So I threw away my suits and ties, bought some Carhart overalls and let this God-given talent guide me. 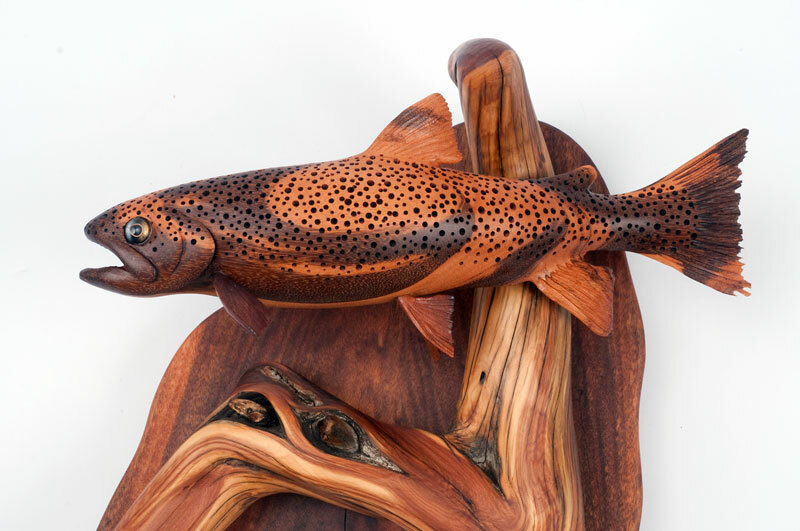 My custom, one-of-a-kind woodcarving sculptures have sold to private owners, corporations and collectors across the United States. 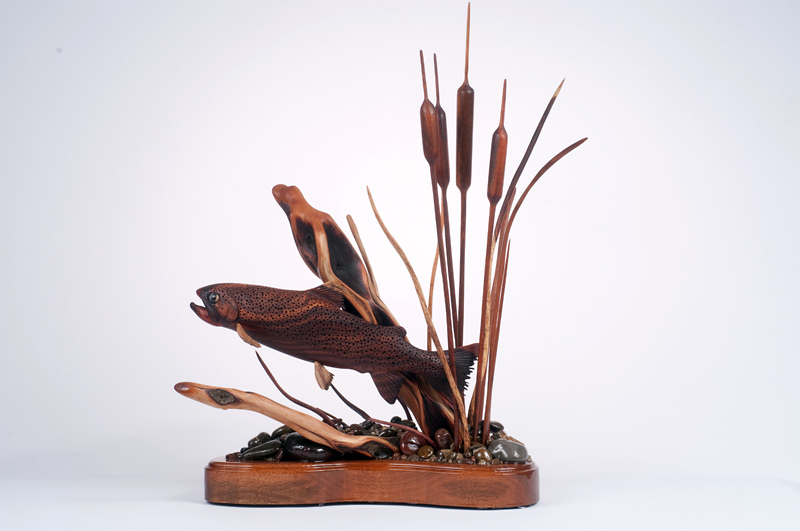 I have taken my 40-year passion of fly fishing in Montana and turned that into another passion: hand-carving native trout, dragonflies, cattails/reeds, frogs, other fish species and more recently full-sized bison skulls. 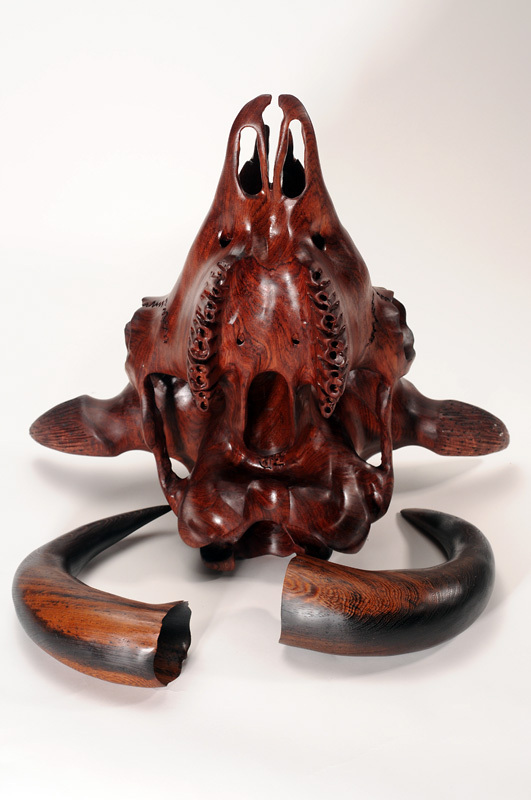 I seek out exotic woods from around the world, including woods from Africa, Australia, Brazil, Central America and Hawaii. 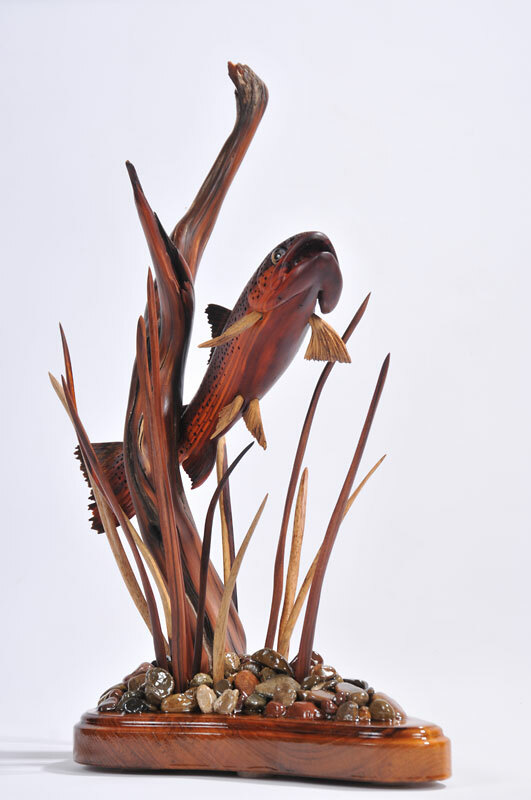 I do not use fillers or paint my sculptures, using just the absolute natural beauty and grains of the many different exotic woods. I found my gift and my passion in life at the age of 45 and am now reaching new heights with every new piece I complete. 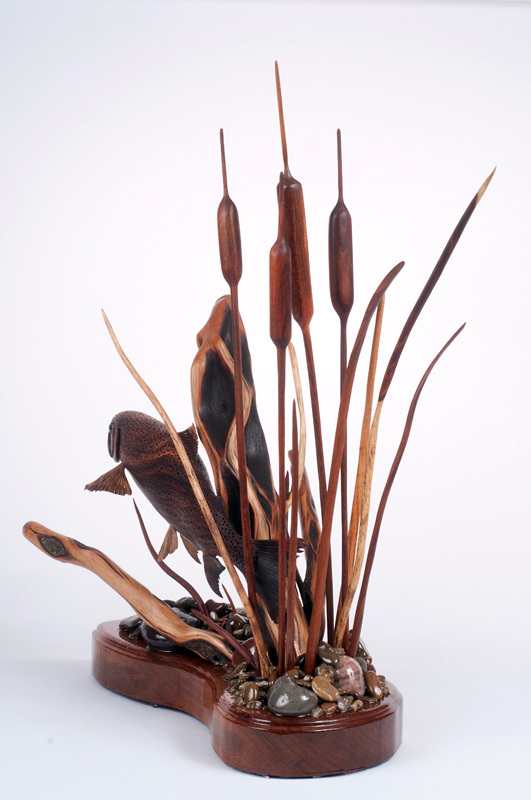 My artwork, under the name of Milo Creek Carvings Fine Art, has been exhibited at the CM Russell Art Auction and the Western Master’s Art Show & Sale during Western Art Week in Great Falls, Montana since 2008. I was juried into The Russell: The Sale to Benefit the CMR Museum as well as the Western Masters Art Show and Sale both in 2011 and 2012. 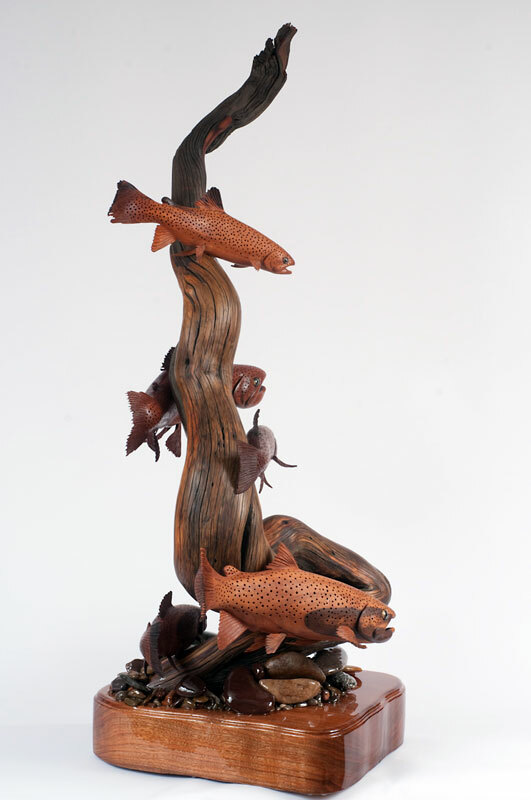 I was also juried into the 2009 Western Design Conference in Jackson Hole, Wyoming. Thousands of artists apply for this show, but only 100 are chosen for this exhibit and sale. I have sold work to private owners in the exclusive Yellowstone Club in Southwest Montana as well as to collectors across the country. Thinking that you are a talented artist is one thing, but being recognized by others for what you do is an entirely different reward. My artwork was featured in two publications in my first full year as a professional artist. In 2009 I was a featured artist in Big Sky Journals August Art’s issue. 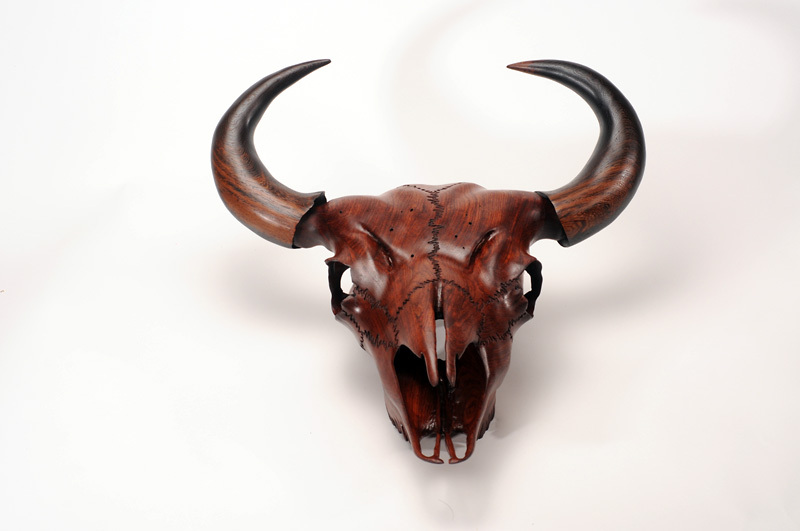 Cowboy & Indians October issue featured me as being one of the best woodcarvers in the country. 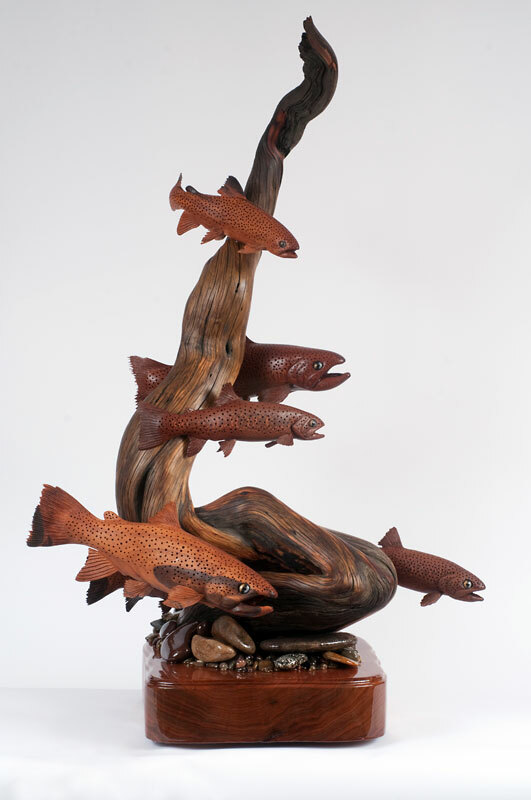 In 2010, my wood sculpting talents were written up in the April 2010 Collecting Sporting Art’s issue of Western Art Collector magazine, which is a premier national magazine for the show and sale of fine western art. 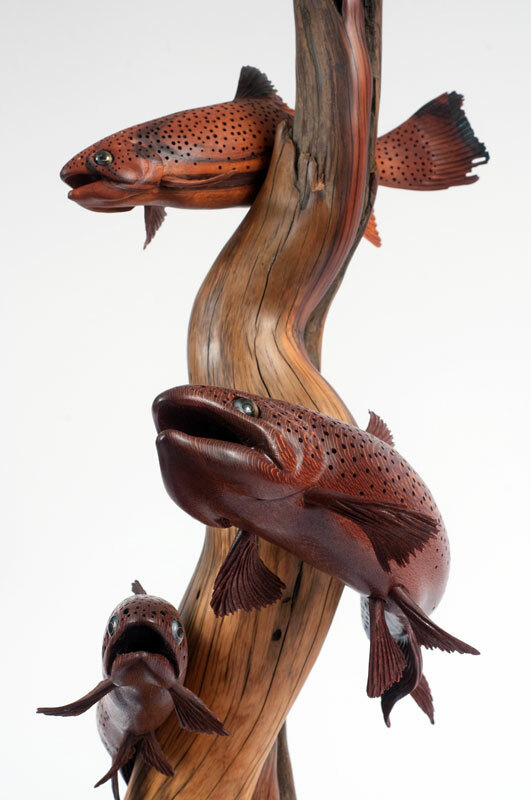 My wood sculptures of fish were selected by the editors and staff of Woodcarving Illustrated, a national woodcarving magazine, to be on the cover of their summer issue. 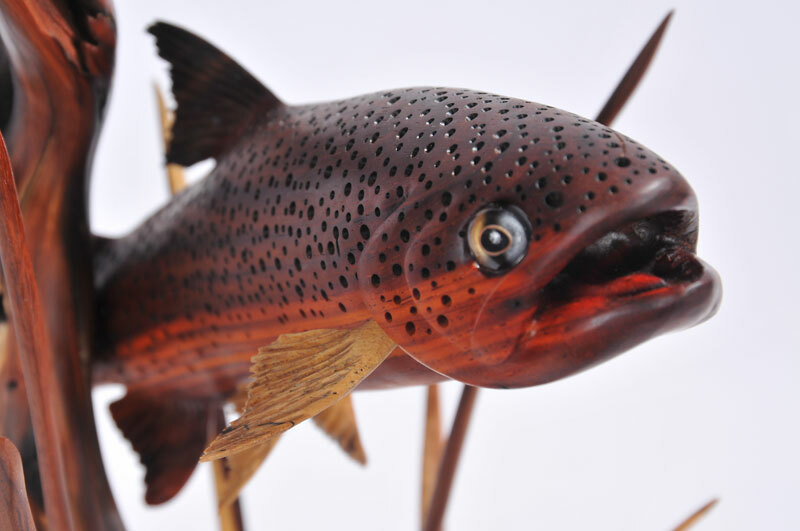 I wrote a step-by-step process of how I carve my fish for that same issue. I received numerous emails from around the world thanking me for the step-by-step explanation. Receiving an image from a young man in Tasmania just starting out, following your directions and doing an amazing job is a humbling reward in itself. In August of 2010, I was asked by the President of the Society of Animal Artists out of Colorado to submit my artwork for membership into the Society of Animal Artists Worldwide headquartered in New York City. I was honored and humbled to have been personally asked by the President of the SAA and look forward to the opportunity to be included into this prestigious group of talented animal artists from around the world. My artwork gained a whole new international audience this past summer in England and Europe. 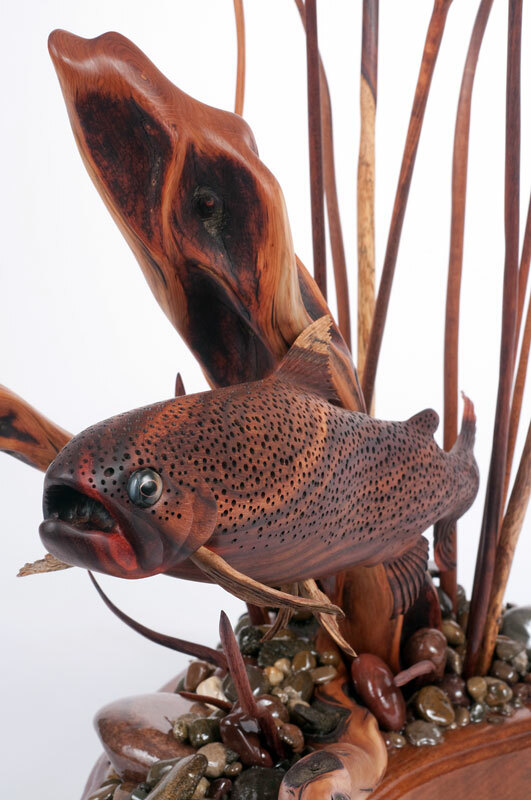 I have written three articles about my one-of-a-kind fish and bison skull carvings for Wood Carving magazine’s 2011 July/August and September/October issues out of the UK. Wood Carving magazine is Europe’s largest publication dedicated to the art and technique of woodcarving and is read in 57 countries around the globe. 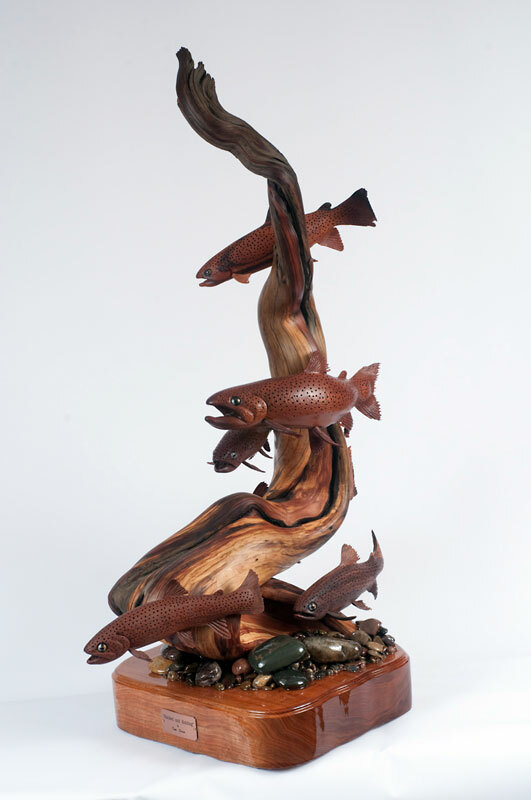 This past December, I was humbled and honored to be awarded one of the highest awards given in the art’s by the Montana Art’s Council and co-sponsored by the National Endowment for the Art’s– Montana’s Circle of American Master’s Award. 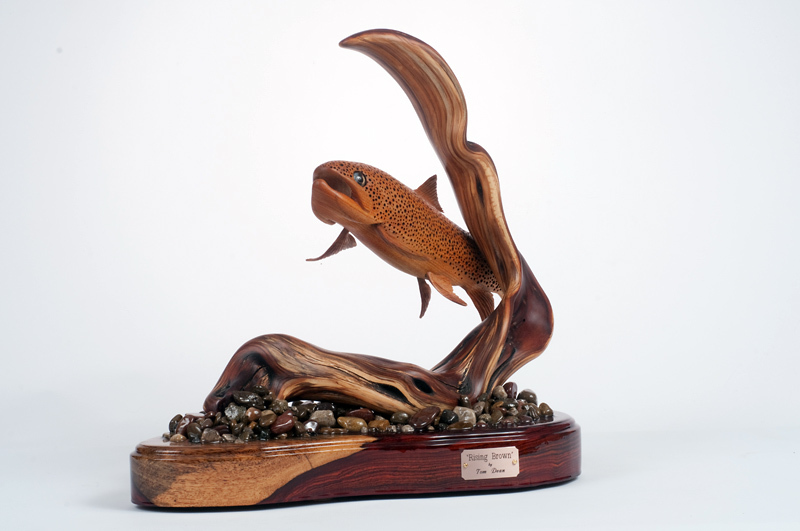 This award was given to me and ten other recipients in 2011 for artistic excellence, craftsmanship and technical skill, authenticity, and contribution to the community.